By 1986 the IBM PC had been around for five years, and that machine and those compatible with it had largely taken over the business microcomputer market. But the home market was different, with companies such as Apple, Atari, Commodore, Acorn, Sinclair and Amstrad holding the bulk of the sales with a variety of mutually incompatible machines. Om paper, Amstrad was the least technically innovative, but probably the most business-savvy. The Amstrad PCW had been launched the year previously, based on a combination of new and old technologies which created a very useful and exceptionally good value machine that had become a surprise hit for home users. 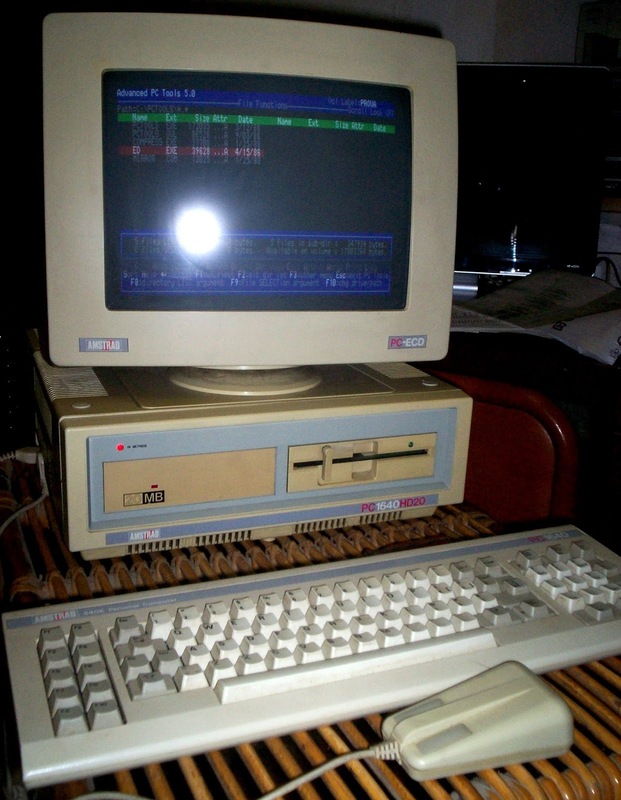 After the PCW, Amstrad turned its eye to IBM PC compatibles. But instead of looking at business users, Amstrad was interested in tapping into the home market. It seems obvious today that you can play games and do work on the same computer, but home ownership of PCs worldwide was still very low. Perhaps the time was right for Amstrad to change that. Launching in the autumn of 1986, the Amstrad PC1512 immediately caused a shockwave in the markets that it was launched in. Following the example of the PCW, the PC1512 combined new and old elements and packaged it up in a smart box with a rock-bottom price. The most basic PC1512 (monochrome display with a single floppy disk) cost juts £399 plus VAT (sales tax). Various options were available, and at the top of the range a colour version with a hard disk cost £949 plus tax. That was still a lot of money in 1986, but even the most basic IBM PC XT would set you back at least £1500. Inside was an Intel 8086 (launched in 1978) clocked at 8 MHz, nearly twice that of the IBM version. 512KB of RAM was standard (expandable to 640KB via an expansion card) plus a tweaked CGA adapter. Cleverly the power supply for the PC was actually in the monitor which handled the necessary conversion from AC to DC and saved on the cost. This also meant that the PC didn't need a fan anywhere as the monitor cooled by convection and the heat dissipation from the main board was minimal.. but it also meant that you always had to use an Amstrad monitor. The PC1512 could output greyscales on a monochrome monitor which was useful for those on a budget. A set of brightly-coloured floppy disks came with MS-DOS 3.2 plus GEM and GEMpaint from Digital Research, along with Locomotive Basic (an Amstrad favourite). GEM was the most-used application after DOS, providing a rudimentary but useable graphical environment. GEM could be used with the rather rat-like proprietary Amstrad mouse which was included in the bundle. In the back were three expansion slots that could be easily accessed via a slide-off cover rather than by using a screwdriver. A joystick could be plugged into the proprietary keyboard and - perhaps as a nod to Amstrad's roots in audio equipment - there was a volume control knob for the internal speaker. Despite the proprietary nature of some of the components, the PC1512 also came with a standard serial and parallel port. The PC1512 was a huge sales success for Amstrad, topped only by the PC1640 launched in 1987 which has 640Kb RAM as standard and upgraded EGA graphics, but this lost the useful greyscale capabilities of the PC1512. The PC1640 addressed most of the shortcomings of the older version and was an even bigger success, and it managed to break out of the home market into schools, colleges and small businesses. The PC1512 and PC1640 sold in the millions. Part of the sales success wasn't just that it was cheap, but it was also very well built and extremely reliable.. despite rumours circulating otherwise (possibly put out by competitors). The PC1640 represents Amstrad's computer business at its peak, but unfortunately this success was not to last. Even though it was cleverly packaged, there was no doubt that the PC1512 and PC1640 were pretty old hat. Amstrad then set to work on the PC2000 Series, comprising of a low-end 8086-based machine, a midrange 80286 and a high-end 8086. Launched in 1988, this was a much more modern design, and these should also have been a huge success.. but they had a fatal flaw. The problem was the hard disks - a batch of faulty Seagate drives led to an unacceptably high failure rate followed by a product recall that seriously damaged Amstrad's reputation. Amstrad later sued Seagate and won millions of pound worth of damages, but Amstrad's reputation never fully recovered. 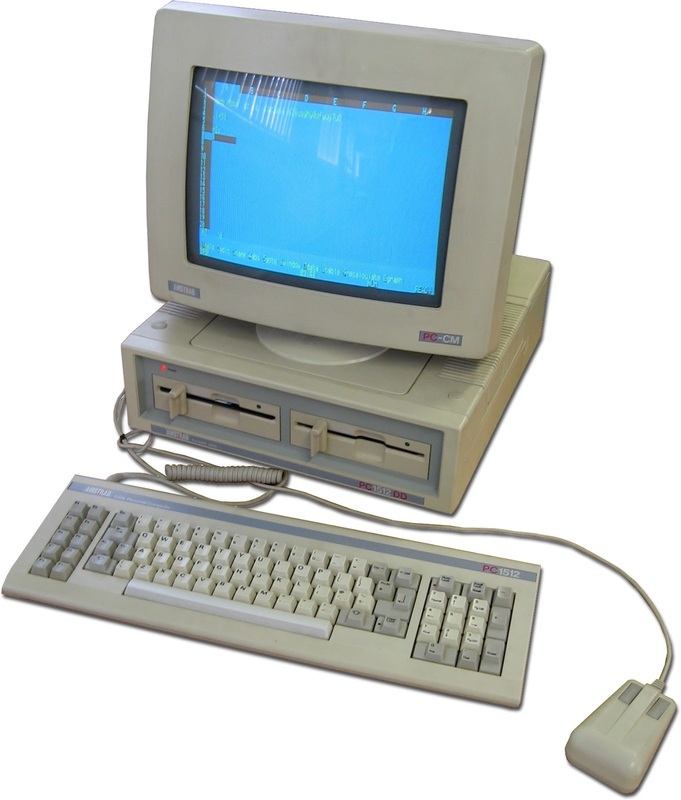 Amstrad kept going in the PC market, launching the PC3000 through to PC7000 ranges until the early 1990s along with some portable PCs. Amstrad's final PC product was the unusual Amstrad Mega PC which also had a Sega Megadrive built in. Today the Amstrad PC1512 and PC1640 are quite collectible, with prices going up to £650 (€720) or so for a top-of-the-range unit in good condition. Old computers take up a lot of space, so survivors are uncommon. Of course, you can get a pretty decently specified modern PC for that sort of money too.. but nothing else quite has the same retro appeal of Amstrad's finest. Image credits: Marcin Wichary via Flickr and Maurindaco via Wikimedia Commons.